At least, the kind that I get nowadays. Although my baby girl did just have her 5th birthday! 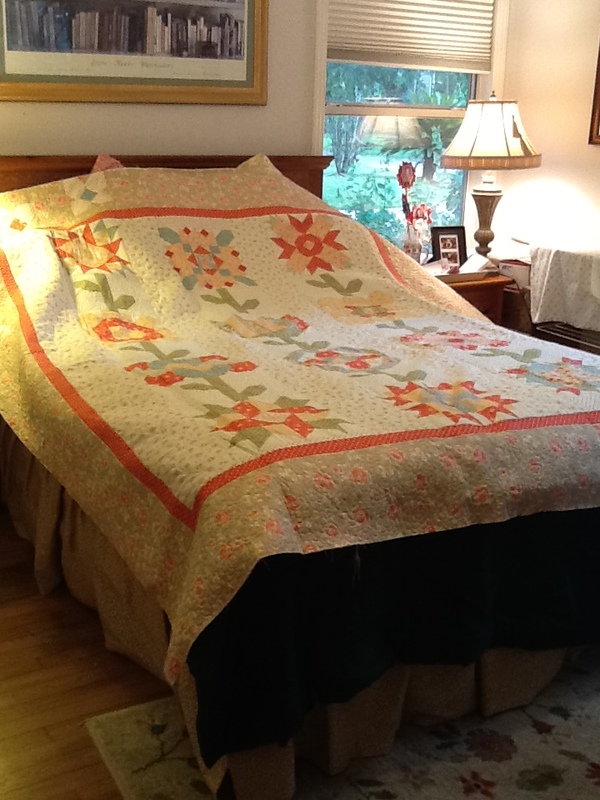 So, as part of her gift this year, I had a pretty, pink quilt done for her and it arrived on our doorsteps today! Sorry for the poor lighting, it was raining outside and overcast. Once I have a nice sunny day and I get the binding on, I’ll take some really great pictures outside. Linh, with LiMa Sews, did a beautiful job (AGAIN!) on this quilt. She did some feather quilting down the long columns and stippling around the flowers. I haven’t had a chance to really inspect it yet, because I was trying to keep Nora from seeing it. Want to surprise her with it at her birthday party this weekend! 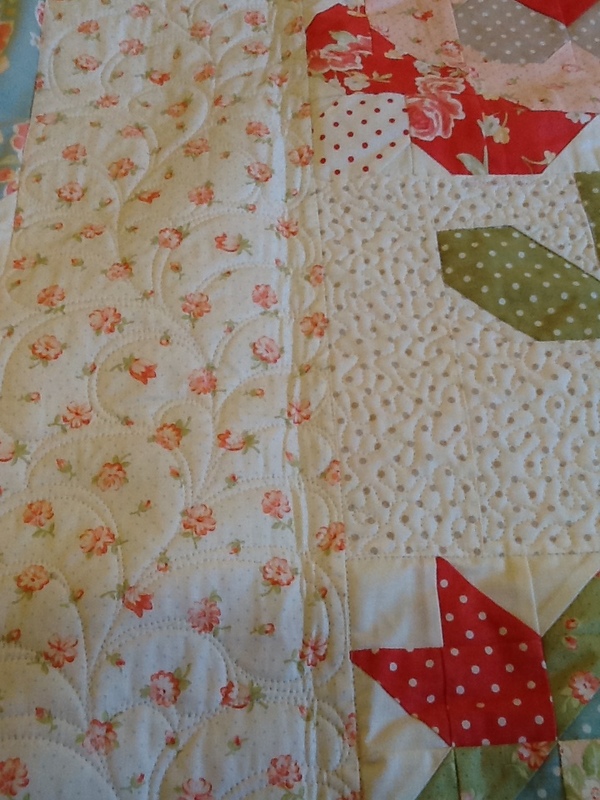 On other projects… I have machine stitched the binding to the front of my Swoon quilt. Now I just have to either machine stitch it from the back, or get started with the hand binding. 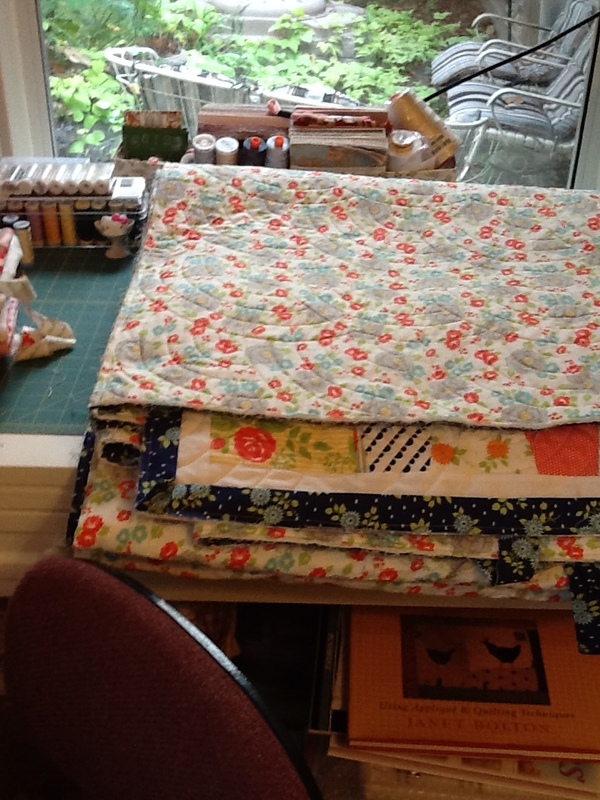 It is a real pain to maneuver around a king size quilt on a small machine in a corner of a bedroom. I may try to move my machine to the dining table and see if it goes easier that way. 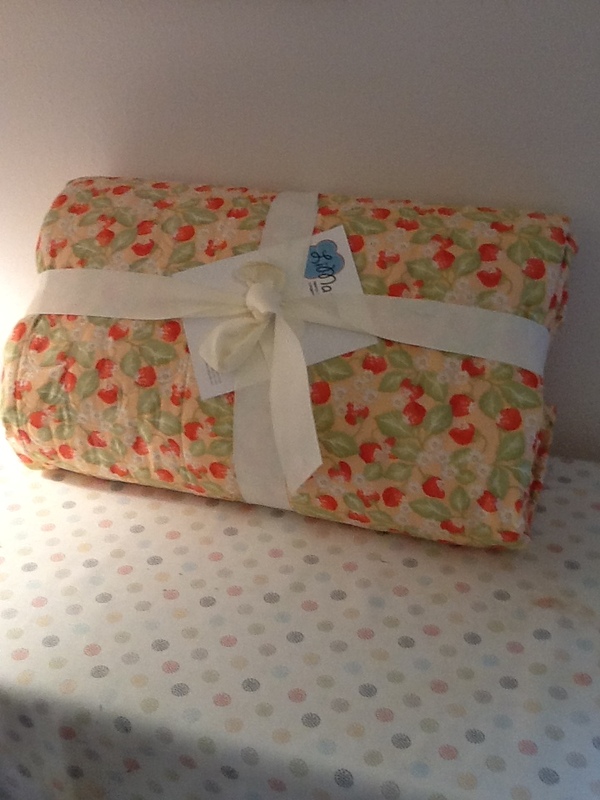 I sent my Rally quilt off for quilting as well, and it is already on its way back to me! I have to get it bound and delivered by the end of next week to that new HS graduate leaving for California. Finally, I have my two blocks cut out for the August month of the current FQS DM BOM 2013 series. Another beautiful basket block that I can’t wait to share. Absolutely no problem getting my two blocks of pieces cut from the one set of fabric this month. Lots left over too! Thanks FQS! Hope all is well with you, lovely reader. I have been super busy with the beginning of exciting school years for my children (Kindergarten and 1st grade!). We are now going to two schools for the first time, which hasn’t been too bad. It’s kind of interesting to see how it is shaping the kids relationship to be more apart and independent. ← The longest Pep Rally ever!! 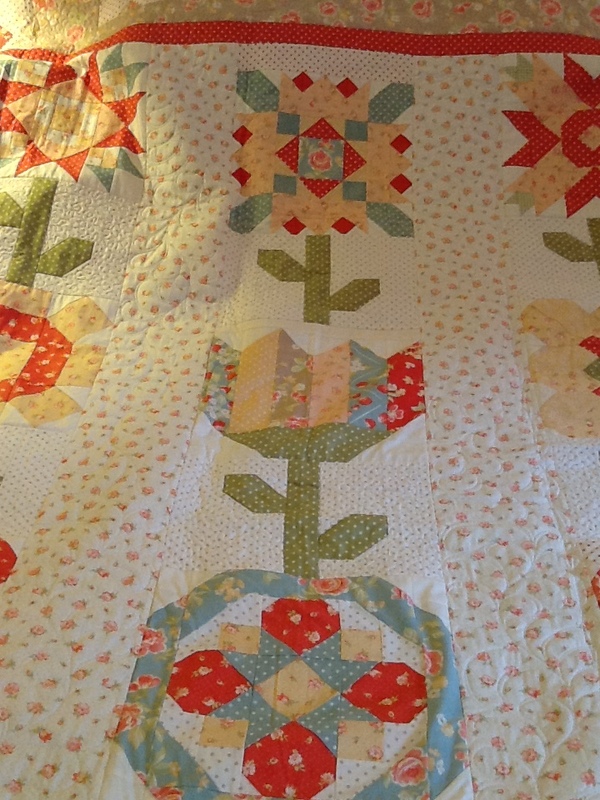 Jennifer, Nora’s birthday quilt is darling! 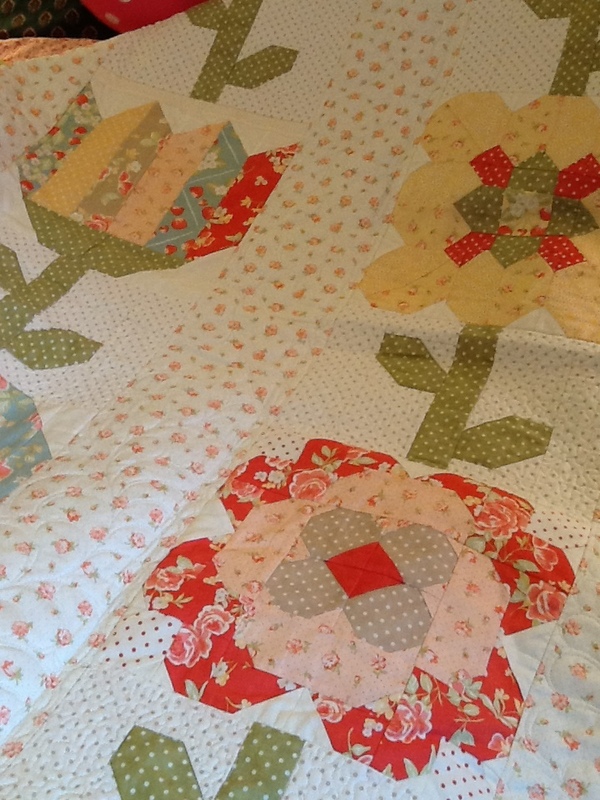 The quilting sets off the blocks beautifully. Do you not like finishing binding by hand? Thank you for the compliment Dawn! I actually do like to hand stitch the binding down, once I have attached it by machine. I was just trying to find a shortcut to getting all of my projects finished fast at the moment. Turns out I just worked on it a little each night and I should be done with it tonight for sure. She’s waited over 3 months for this gift, so one more day shouldn’t hurt. She doesn’t know she’s getting it anyway. Your quilt tops are gorgeous! We have the same taste in fabrics, so I will naturally think so! The quilt for your daughters birthday is beautiful. So soft and pretty. I can’t wait to see your swoon all finished too. Thanks Sarah! I hope to get into my Honeysweet fabric soon too!